Sales - I love them, especially when there's a bargain to be had! 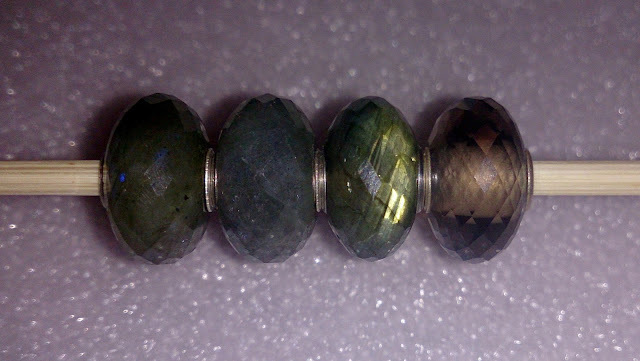 I love Labradorite so I was delighted to find a lone Trollbeads Labradorite listed in a sale; order duly placed and a package arrived the next day... great service! Here it is next to my other three... can you spot the difference? Yep they'd sent me a Smoky Quartz instead! Smoky Quartz has never been on my radar, it's not a bead I've ever gone "Ooh I must have one of those!" but given it's rather marvellous sale price I thought it was worth trying on some bracelets to see what happened. Armed with my trusty mobile camera and some other beads new and unused (or old and not used as much) along with a sprinkling of silvers I made a start. 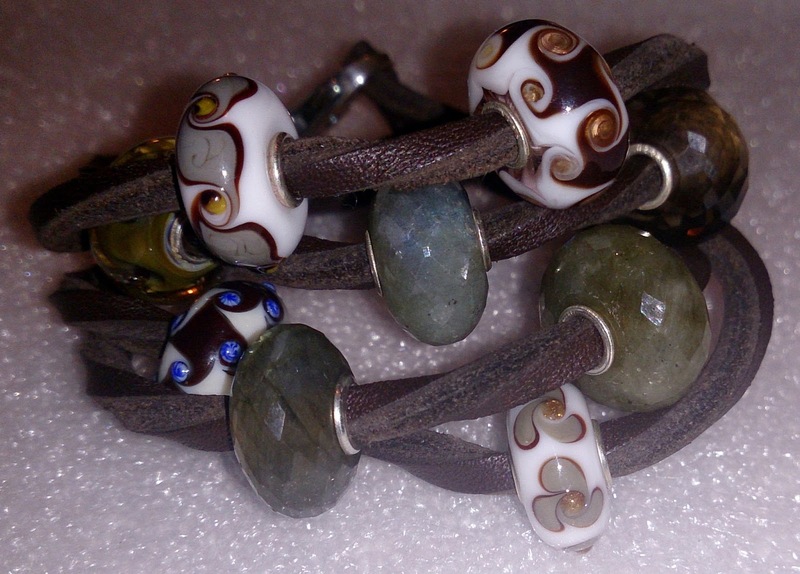 Firstly I ignored the silvers completely and tried a glass, stone and leather bracelet. 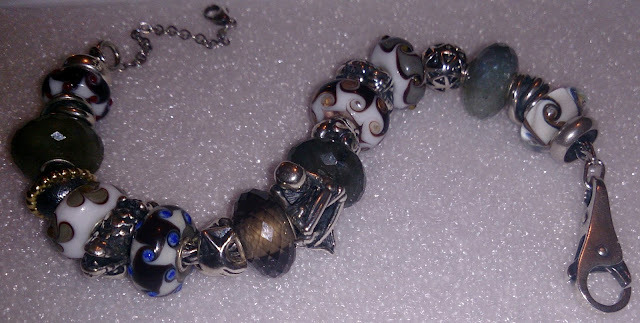 I thought the leather would pick up the colour in the Quartz and I chose the other beads for their blue/grey and brown tones. The flash on my mobile camera has made the white elements look a bit overpowering but in natural daylight this bracelet has some lovely muted shades - unfortunately by the time it came to take photos I'd lost most of the natural daylight. Note to self - blog earlier!! I also had a play using a full silver bracelet and this is the one I'm currently wearing. Smoky Quartz is not the most obvious stone I'd pick out for myself despite my love of stones generally but on balance I think I'm going to keep it. The price was excellent, I've thrown a few combos together and think it will get use on my bracelets and it goes well with a lot of beads that don't always get an outing from the bead box so hopefully it may give new life to some of my white and brown/grey beads. Not forgetting my original order - if anyone does see any Trollbeads Labradorite beads in the sales - do let me know; I'm always looking for more of these!